The law went into effect in March — a month before Snyder filed his suit against the City Paper, claiming the alternative weekly published untrue statements about him in a 2010 cover story. Like similar laws passed in more than 25 jurisdictions, the District's Anti-SLAPP Act is meant to prevent wealthy people and companies from using libel lawsuits to cut into the First Amendment rights of others who might not be able to afford to defend themselves. Snyder wants DC's Anti-SLAPP law declared unconstitutional. He's essentially claiming that elected officials in DC have no right to pass laws that govern the DC court system, which puts the binkie-throwing billionaire in roughly the same category as the skunks in Congress who whenever a bill comes up to give full voting representation to DC residents conspire to kill it with riders to repeal DC gun control laws (this in a city that used to be the country's murder capital). Understandably, the DC government is concerned about the attempt by Dan Snyder, whose father was a journalist, to undermine free speech protections in DC. The chances that the DC Superior Court will accept Snyder's challenge to the validity of the Anti-SLAPP Act are slim. But if the court rules that the DC Council didn't have the authority to pass such a law, the statute's protections could disappear. The city would appeal, but the ultimate effect, should Snyder somehow be able to successfully ride out this nasty power trip, is that he would succeed in limiting the scope of the DC Council to pass laws that govern DC residents. "[This] could have a profound impact on the rights of political participants in the District of Columbia," said the DC Attorney General. 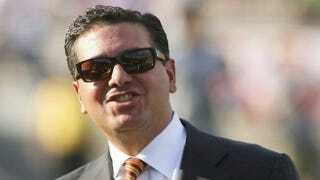 Dan Snyder has long been an enemy to Redskins fans. Has he now become an enemy to democracy? [Note: We've been linking every day to Dave McKenna's "Cranky Redskins Fan's Guide to Dan Snyder," the story that set this sad saga into motion. We'll post McKenna's story until Snyder's dumbass lawsuit is tossed out. And we'll post it right now (which means this is "We Are All Dave McKenna CCIX").